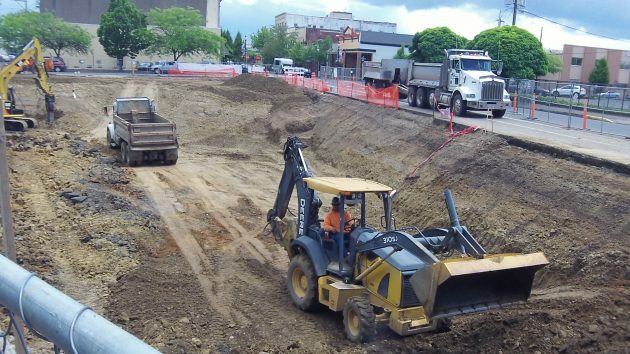 Though stopping well short of China, excavation continued Thursday at the Albany Carousel site. They’re digging a pretty big hole where the new Albany Carousel building will be, and somebody wondered why the excavation has to be so deep. As luck would have it, the Answer Man had nothing else to do and got on the phone. I checked with Bea Castillo, the carousel’s operations director, and Dr. Gary Goby, the retired physician who is helping the carousel board oversee construction of the new building. In short, the plans call for an 8,000-square-foot basement with walls 13 feet tall. The basement will house not just storage but also, among other things, working space and equipment for volunteers to maintain the wooden carousel creatures, and to carve new ones and paint them. There also will be a break room and all kinds of mechanical gear for the building. The height is meant to assure plenty of head room under various pipes and ducts running below the ceiling. The point of all that room, Goby explained, is to have all support operations tucked away in the basement so that almost all 14,000 square feet of the main floor will be functional as public space. The project ran into a surprise when it was discovered that the St. Charles Hotel had a basement. The St. Charles occupied the site, at the northwest corner of First Avenue and Washington Street, from the late 1800s. The basement was filled with rubble when the place burned down. Later, the lot was occupied by a building that served at various times as an automative business, a poultry processing plant, a craft shop and, until last month, the carousel operation’s temporary home. In any case, the former basement had been forgotten. And before proper excavation could start, rubble 9 feet deep had to be cleared away first. The animals are on display at downtown businesses. To volunteer, contact the carousel, 541-791-3340. Carving and painting going on now inside their temporary space inside Two Rivers. With all the rooms being used for storage and working space, are they assured that nothing will be damaged if the river rises and it floods? Monteith Park floods every year and water comes up to the stage. Just want to be sure that all the hard work being done now will not be swept away by floods. The site is well above the elevation of the part of Monteith Riverpark that occasionally floods.